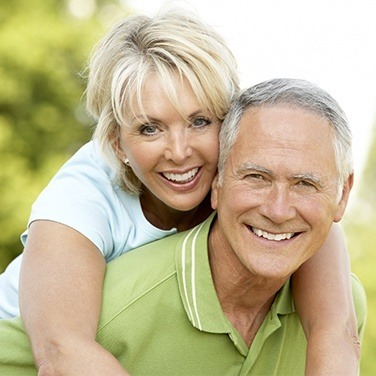 Modern dentures are more natural-looking and well-fitting than in previous generations. Dr. Smith and Dr. Yap work with a local dental lab that uses state-of-the-art materials for the most esthetic appearance and comfortable fit. And if your case is appropriate, you may want to consider implant-retained dentures. Complete, removable dentures – This traditional option replaces the entire row of teeth on the upper/lower arch. Designed according to your unique measurements, needs, and preferences, complete dentures look and feel similar to natural teeth. Partial, removable dentures – This option is great for those patients who have some healthy teeth remaining. A partial denture fits with surrounding teeth like a piece of a puzzle and is secured with inconspicuous clasps or brackets. Implant-retained dentures – Held in place by strategically-placed dental implants, this option eliminates slipping, clicking, and the need for adhesives or clasps. Implant-retained dentures also stimulate the jawbone, reducing the amount of deterioration that a patient experiences over time. Dr. Smith or Dr. Yap will carefully review your medical history and oral health to determine which option is right in your circumstances. Then, he’ll carefully explain his recommendation, so you can make an informed decision about the future of your dental health.